At the battle of the Coral Sea May 8th 1942, the US carrier’s Yorktown and the 33,000-ton Lexington led an assault on a Japanese fleet built around the 28,000-ton carriers Shokaku and Zuikaku. This was the first battle between two carrier groups in the Pacific War. The US carrier’s were first to launch an attack with two bombs from Yorktown’s aircraft and one from Lexington’s damaging Shokaku to an extent her aircraft couldn’t be launched. A counter attack by Zuikaku’s aircraft damaged Lexington with two torpedoes and three bombs and Yorktown with one bomb. This forced the US ships to break off the engagement and set a course for Pearl Harbor to undergo repairs. Before reaching Pearl Harbor, Lexington had to be abandoned as fires in her lower decks were spreading towards the ammunition stores. US warships used torpedoes to sink her after the crew had been transferred to other ships. Following US intelligence reports stating Japanese warships were closing in on Midway Island, Yorktown’s repairs at Pearl Harbor were hurriedly completed so she could join her two sister ships, Enterprise and Hornet, in a battle group being deployed to intercept the Japanese fleet. As Japanese carrier aircraft were being rearmed with bombs for a second attack on Midway, one of their scout planes spotted the US carriers closing in. The Japanese commander put his entire fleet in danger at that time by ordering his aircraft to be rearmed with torpedoes for attacks on the US warships. Before that operation could be completed, US aircraft began their attacks. Of the 41 US Devastator torpedo aircraft that made the first attacks, only six survived dogfights with Japanese Zeroes. As the Zeroes were low attacking the torpedo aircraft, Dauntless dive-bombers from Yorktown attacked Soryu with three 1,000 lb bombs finding their target. Dive-bombers from Enterprise also took that opportunity to attack Kaga and Akagi. With these three Japanese carriers heavily damaged, only Hiryu managed to launch an attack of 36 aircraft. Three of Hiryu’s aircraft made it through Yorktown’s fighters with bombs from all three hitting their target. Just as the fires on Yorktown were being brought under control, she was targeted by Hiryu’s torpedo aircraft and hit by two torpedoes. At that time, aircraft from Yorktown and Enterprise were attacking Hiryu. As four bombs wrecked her flight deck, Hiryu’s surviving aircraft were forced to ditch in the sea. A salvage crew boarded Yorktown two days later to carry out temporary repairs. Just as it looked like she might be saved, a Japanese submarine fired two torpedoes into her hull. Yorktown capsized and sunk the following day. Hornet had to be scuttled after being damaged at the battle of Santa Cruz October 26th 1942. Enterprise survived the war only to be scrapped in 1958. The US had 37 aircraft carriers available during WWII that entered service between 1922 and 1944, 6 were sunk such as Langley dammaged by dive bombers then scuttled Feb 1942, Lexington at the Battle of the Coral Sea May 1942, Yorktown Battle of Midway June 1942, Wasp Guadalcanal Sept 1942, Hornet Battle of the Santa Cruz Oct 1942, and Princeton Battle of Leyte Gulf Oct 1944. 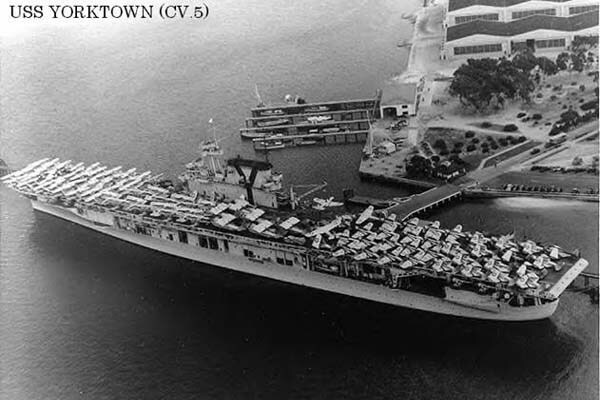 Four of these cariers that saw action during WWII have been preserved as museums, the second Yorktown at Mount Pleasant- South Carolina, Intrepid at New York, the second Hornet at Alameda- California and the second Lexington at Corpus Christi-Texas. USS Carrier List and more info.